As we drive around the city, suburbs, or countryside, we often see signs that say “No Trespassing.” Sometimes they are posted on vacant pieces of land or they are on sides of warehouses. This statute comes into play when a person trespasses inside a structure or a car. The word structure is defined in Florida Statute 810.011 as any building with a roof and its curtilage regardless of whether the building is temporary or permanent. A structure may be occupied by people but structures are not dwellings. Examples of structures are gas stations, bars, car garages, amusement park buildings, restaurants, etc. A dwelling is the legal term for what we commonly call a home. The term conveyance is a broad term used to refer to airplanes, boats, cars, trains, jet skis, motorcycles, etc. To easily understand conveyance, think of it as something that moves you from point A to point B. The key to understanding this statute is this statute prohibits trespassing inside a structure or conveyance while Florida State 810.09 prohibits trespassing on property outside a structure or conveyance. (3) You were without authorization, license, or invitation to enter or stay. (3) You did not leave the structure or conveyance. The difference between the two is that the first one had no warning given while the second one did have a warning. The first way to commit trespass is by willfully entering in the structure or conveyance. “‘Willfully’ generally, and as used in this trespass statute, refers to a general intent and merely means . . . the entry or remaining be intentionally, knowingly and purposely done.” Rozier v. State. You know if the building or conveyance was yours or not. The entry was not an accident or mistake; however, life has a way of creating situations where you might mistakenly trespass inside a conveyance or structure. What happens when someone invites you into a structure or conveyance and you do not know who owns it? Are you supposed to check the property records for buildings or the title of the car before you enter? That would be impractical and absurd. For example, let’s say that your friend offers to drive you around in a stolen car. You don’t know it is stolen or you do not have any suspicion it is stolen. A Florida court said that in situations like this, you did not willfully trespass. See P.W. v. State. The warning must come from an owner, a lessee, or an authorized person. The warning can be done for whatever reason. This has caused some people to voice their concerns that this statute can be used for purely discriminatory purposes such as telling women, minorities, immigrants, etc. to leave the property. Anyone who trespasses in a conveyance or structure commits a second-degree misdemeanor which is punishable up to 60 days in jail and a $500 fine. 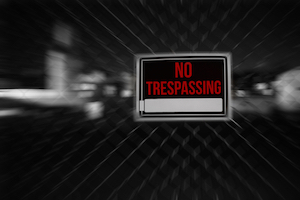 The trespass can be enhanced to a first-degree misdemeanor by the individual trespassing while another person was inside the structure or vehicle. A first-degree misdemeanor is punishable up to 365 days in jail and a $1,000 fine. Anyone who has a Florida concealed weapons license and carries a firearm concealed should be careful to not trespass. The trespass can also be enhanced by the individual being armed with a deadly weapon inside the structure or conveyance. The crime is enhanced to a third-degree felony which is punishable up to 5 years in prison and a $5,000 fine. If you, a friend, or a family member have be arrested and charged with trespassing inside a structure or conveyance anywhere in the Palm Beach or Broward County area, give our office a call. We want to talk to the defendant to find out what happened. Our attorneys will look at the defenses which are available and tailor a defense for the case. We will negotiate with the prosecutor to drop the charges. Sometimes prosecutors don’t agree to drop the charges and our attorneys start preparing for trial. Our attorneys will take depositions of any witnesses or police officers involved. We will further develop alternate defenses and strategies to your case all the way to trial. At trial, we will seek to have you acquitted by a jury of your peers. If the evidence against you is great, it might not be the wisest to take the case to trial, but to negotiate with the prosecutor for a lesser charge or lesser sentence. Our attorneys will aggressively work at negotiating with the prosecutor to get you the best outcome possible. Whatever the situation may be, our attorneys will seek to get the best outcome for you!